Hey, all! I have been getting a lot of feedback that many of you cannot find this product at your local hardware stores. I have personally contacted Rust-Oleum and unfortunately they have discontinued this Tile Transformation Kit in most stores. For those interested, they have informed me about another similar product called Specialty Tub & Tile Refreshing kit —> Please note, I did not test this kit out, just passing the info along! Are you curious as to how this tile. 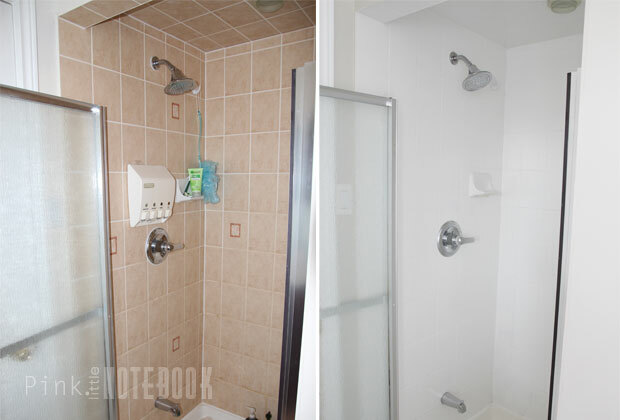 . .
or how this shower stall transformed to that? Well then you came to the right place! During last week’s BIG bathroom reveal, a lot of you were surprised to learn that bathroom tiles can actually be painted! As you may recall from my One Room Challenge, the only area I replaced the tile was on the bathroom floor. The pink tiles around the tub and the shower stall where left as is. I felt like it was a waste of time and money to tear down perfectly good tile due to its dated colour. So I opted for an easier solution, tile paint! And what a transformation it ended up being! Now I’m not going to lie, at first I had some hesitation to tile paint. . . But after a little online research and many positive reviews (gotta love the internet), I decided to give it a try with Rust-Oleum Tile Tranformations – Solid Colour Textured Finish. Just an FYI, there are two different types of Rust-Oleum tile transformation finishes: the solid colour texture finish (the one I used here) and the natural stone finish. One kit covers 50 square feet (it’s the size of a quart) and only one coat is needed. However, I personally found that the product graciously covers a little more than that! There are 14 colours to choose from. Keep in mind if you purchase the kit, you must get the colour tinted before you leave the store. Yes, even if you want white. This is epoxy paint that is engineered to bond tightly to ceramic or porcelain tile. It does smell! Any brushes, trays or clothing that this paint touches is ruined. Nothing can be saved! Paint during the day and use extra light source if needed. Shadows and tile paint are not friends. Follow the instructions correctly and I promise you that you will love staring at your newly painted tiles. The process is pretty straight forward. Here we go. Use the enclosed cleaner to scrub the entire surface you want to paint and make sure you do a really good job. Remove all caulking. The paint will not stick to it. Tape off the areas that you want to protect. This paint kind of reminds me of a krazy glue on steroids, it is super duper adherent and will not come off easy after it dries. Make sure you protect your fixtures or any areas that meet the wall. Cover your tub or shower areas with a drop cloth. Put your protective mask on and mix the two parts of paint together (pour Texture Bond Coat A Activator into Textured Bond Coat B Base). Be prepared for some harsh smelling fumes. This process seemed to work okay for the bathtub but as you can see two people in our tiny shower stall was not happening. Since you have to move fairly quickly with this paint, the hubby just used the edge of the roller to cut the corners in the shower. It went a lot faster this way. However, this may be the very reason why our roller started breaking apart at the very end. When everything is all said and done, inspect for any drips, imperfections, uneven texture before you call it a day. We had a little unevenness towards the bottom of our shower stall. I guess working in a tight space, we didn’t realize the shadows starting to creep in especially when we got to the bottom. If we had the extra lighting, we would have caught this but in our current lighting conditions it was literally undetectable. So if your working in a tight space where shadows maybe lurking around, bring in the extra lighting! I was a little worried how these raised flowers would look after the paint job. I can tell you I’m quite pleased with the results! In fact, it took me a couple of minutes just to locate one of these flowers to take a photograph. I also had to darken the image a bit just to show you the outline. One last thing. I just want to share my stupid mistake so this does not happen to you. In the beginning of this post, I told you to make sure you throw everything out after use. Out of sheer habit, I went to throw our painting tray in our laundry tub for washing. After a couple minutes, I realized what I did. I went back to get the tray and some paint had fallen into our tub. I instantly tried to wash it. Of course, I just made it worst and now it permanently looks like this. Overall I was quite please with this product. It covered my tiles extremely well. This bathroom transformation has to be one of my favourites. It just goes to show you that you can work with what you got in order to spruce things up on a friendly budget. If you have anymore questions regarding this product, feel free to contact me or leave a comment below! Disclosure: I received samples of Rust-Oleum’s Tile Transformations (Solid Colour Textured Finish) Kit for review purposes only. The views and opinions expressed in this post are completely based on my own experience. That’s awesome! I never knew tiles can be painted and this info comes in hand as I’d love to redecorate my parents house but don’t have the money. Thanks for this. Hi Petro! You should check it out. It definitely makes a huge difference! Thanks for stopping by. Hi dos bulders wherehouse sell this product? Does the paint smell bad after drying? Yes it does. Make sure you keep the windows open. Sabrina how long does it take to dry before you can walk on the tiles or get them wet? Looks amazing.. Are you supposed to paint over the grout also.. And how long do we leave to dry? this is too awesome. We just moved into an OLD house and our tiles could def use some work. I thought we would have to replace them. I will pin this and show my husband and see his thoughts. Hi Aimee! If the tiles in your home are still in good condition, I would definitely consider using this product. You won’t regret it! However, if the tiles are damaged or need lots of repairs, I think you would be better off replacing them. Thanks for comment! Wow, what a transformation! The “new” tile looks AWESOME–I would have never known you could paint it! I’m sure this was quite the project, but you did a great job. Quick question… Did you paint the floor of your shower? That was a great tutorial Sabrina! Hi Meredith! No, I didn’t paint our shower base. It’s fiberglass. 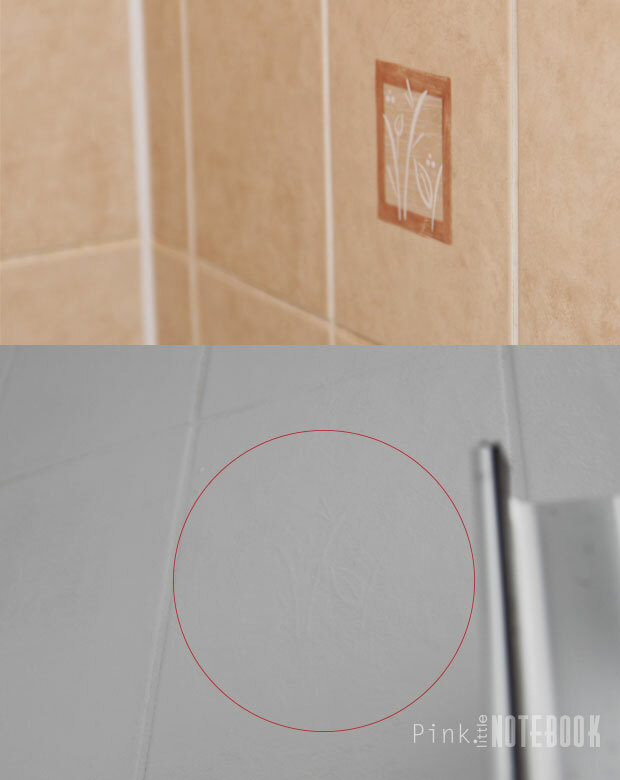 The product itself specifically states for use on “wall tile”. However, I read some reviews where others have used it on floor tile with little to no maintenance afterwards. Hope that helps! Best way to clean a fiberglass tub that’s got years of grime is with Easy-Off Fume Free Oven Cleaner! Works like magic and doesn’t damage the surface. 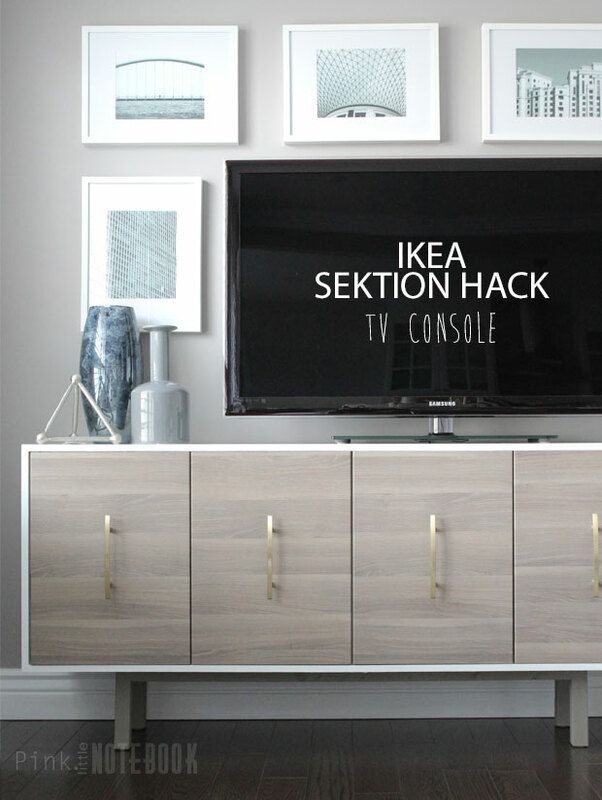 I learned this from bloggers who have rental units. They use it to clean between tenants. WOW! This is a wonderful idea! I didn’t know that we could do this to tiles! It’s fun and also a money saver! Thanks for sharing the pics and instructions! So cool! I hate my bathroom, it is in desperate need of a makeover. You have inspired me!! The previous owner of my house painted the tiles but obviously didn’t use the right product because it’s all peeling off. I hope the Rust-Oleum tile transformation kit works on previously painted tile. I’ll have to find out and if it’s recommended, give it a try. Your bathroom looks great! Sabrina, did you all pull an old cast iron bathtub out of your “new” house. Our cast iron tube installed by builder in 1977 is in very good condition and because of the labor involved and disruption of pulling it out of there, we have chosen to leave it as is. We are shower people so it hasn’t been used for bathing but about 6 or 8 times over a 9 year period we’ve been there. I’m trying to find out how the frame was built around the “new” tub you have in your bathroom. I remember when our SIL installed a jacuzzie type tub in their house, he built a frame surround the tub and tiled it, completing the look you have on yours. I like that finished look, how does one built that frame and tile it around an older bathtub? This is amazing. I’m thrilled to learn that this can be done! Thanks! What an awesome paint! MY MIL has a habit of painting EVERYTHING!! She even tried painting a toilet seat, lol. Painting rubbing on your bum. She would love this stuff 🙂 I will let her know about it. I love the thoroughness of your review. Looks great!!! This was very helpful as I am thinking of using this product to paint the tiles of our backsplash. Quick question: Which shade of white did you choose – the “White” or the White Frost”? We went with this product and it worked great except we used the White Frost and it is really a baby blue. Went from one colour (Salmon Pink) that my wife hated to one that she dislikes. Do you have any suggestions of how to correct once the tile is painted with the White Frost. Your post makes me feel I could do this! I had never heard of painting tiles until I visited my brother-in-law and his wife and saw their “new” tile in their older house. The end result is really impressive. Where can I buy this product locally? I am looking online at home depot and lowe’s and cannot find it! I really want it too.. or more like need it. Where can I get the tile transformation kit? I have been to the big box stores but they don’t carry it. Hi Glen, if you’re located in Canada, the product is sold at Lowe’s, Home Hardware and Home Depot. If you’re located in USA, it’s sold at Lowe’s, Home Depot and Ace Hardware. 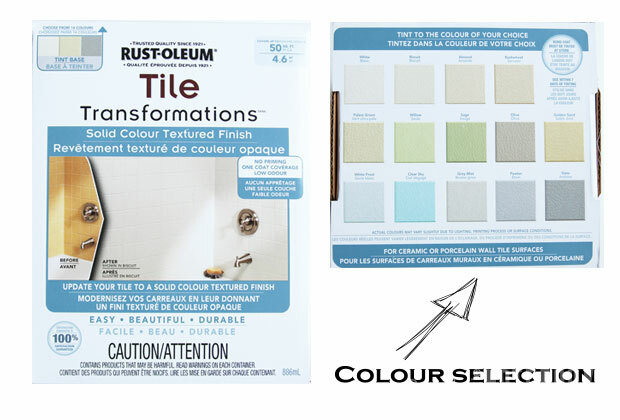 If you still can’t find the tile transformation kit, please contact consumerservices@rustoleum.com. Hope this helps!!! Hi Crystal, I put in a polished porcelain tile. I loved the simplicity of it and the fact that it almost resembles marble tile! Thanks for stopping by! Hi there! How many kits did you need to use for this project? Hi Kayla! I used one kit for this project. One kit covers 50 square feet. Where did you buy the ruts-oleum tile transformation kit? The bathroom looks incredible! I’m new to your site, did you use a similar paint product on the floor as you did with the tub/shower or did you re-tile? WOW! Looks absolutely fantastic. Very courageous to try that out but obviously it was worth it. Great job! Although this is a great product it has one major problem ! Contrary to the manufacturers information, the paint does not keep in the sealed tin once it is mixed. You need to complete your job in one day. as the following day it has started to set solid in the tin and very soon becomes completely solid.. This proves very expensive if you have to buy another kit to finish the job.. Although various tints are advertised, it seems that white is the only colour available..
Congratulations on the wonderful results. Did you really mean to scape out all the caulking? I could not find any notes about replacing the caulking. Did I miss something? Hi Hella! Good catch! Yes, you need to scrape off all the caulking that the paint will come in contact with prior to starting. Once you are done painting, you will definitely need to re-do all the caulking that you took out. I believe the only reason they suggest to do it that way is because if you were to paint the caulking, it wouldn’t last over time and it would just start to wear away. Hope that helps! Could you be confusing the two terms “caulking” and “grout”? The video shows cleaning the grout, not removing it The caulking is between the tub and tile and it is removed. I seriously wouldn’t consider digging out the grout! If you had to do that, you might as well retile. Wow – I really want to do this. Our house flooded in Katrina & bathrooms were fine because the old tiles were set in mortar on lathe; lots of concrete.. To rip this out would be super $$. I can’t wait to try this on ugly old hexagonal tile covering walls & floor. What colors would you suggest? I like color but darker selection is probably way too much. How long do You have to wait before showering? How does it hold up with the Water hitting it? Hi Shirley, I believe we started using the shower two days after painting it. It holds up extremely well to water. This is epoxy paint that is engineered to bond tightly to ceramic or porcelain tile. It literally has the texture of glue so once it’s on, there’s no taking it off. I had to special order this from our local hardware store. No big box hardware stores carry it (St. Paul, MN). It’s expensive at $120/kit, and I need 2 kits to cover all the tile in my bathroom. But I have heard nothing bad about this stuff! Can’t wait to finally redo my shower! Hi! im just wondering how it is holding up? 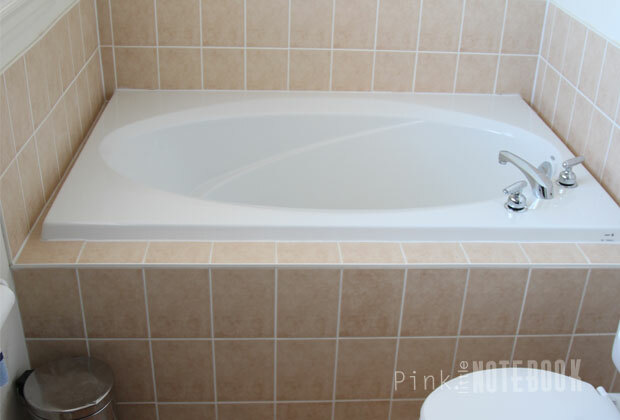 we are thinking of doing it in our tub and the tile, its a beautiful yellow color! I do like a clean tub so im not gentle on my scrubbing, im just wondering how it is holding up for you, if its wearing or chipping off at all? thanks! looks great! Question. One week after painting tub and tile. IT STILLS SMELLS AWFUL IN MY HOME! Windows open I can’t get rid of the smell. Help! Would that work I mean if the paint forever colored the spot on your tub you can just paint the whole thing and forever do away with the “stain”? Sarei molto curiosa di sapere se a distanza di tanto tempo i risultati sono ancora belli. I love your results!!! How has it held up?? What cleaners do you use in it? Thanks so much!!! Would this paint also be able to be used on kitchen tiles? Hi Marisol, I can’t see why you wouldn’t be able to use it on a kitchen backsplash. However, it you were thinking to use it on kitchen floor tiles, this product is not recommend for floor use. Hope you find this helpful! Oddly these flower tiles are the identical tiles I have in my bathroom and the reason I came to find a tile painting tutorial! Hi Sabrina, wondering how your painted tiles are holding up? any chipping or peeling of the paint? Are you able to clean the tiles the same as before? Would love to know as I’m considering painting my tiles. Thanks! You said that ALL the grout/chaulking MUST be removed??? When and how do you replace it? 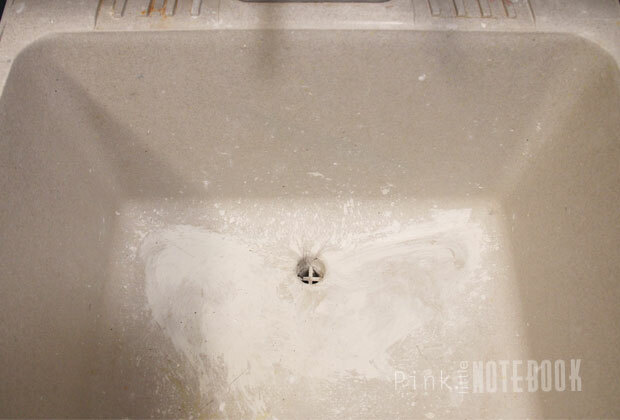 If the paint doesn’t stick to grout, then what? I’m confused. HI Danielle, You don’t have to remove any grout at all! I stated in the first step to remove only caulking (which is usually around the fixtures or the base). 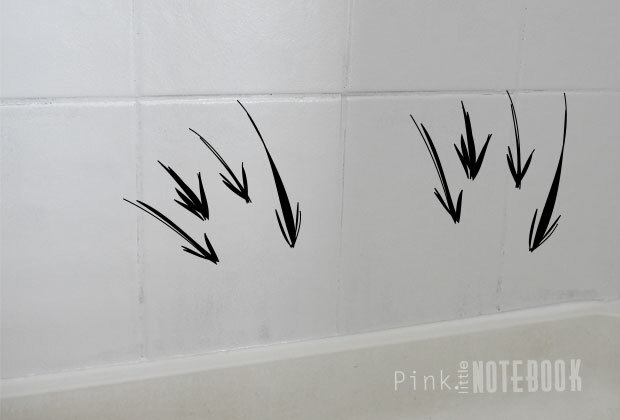 The tile paint sticks to tile and grout so you don’t have to worry about that. Wherever you removed caulking is the only place you will have to put it back after you complete the paint job. Hope that makes sense. Your bathroom looks excellent! We just finished painting our bright blue tub as a trial run to see if it actually worked and if we should proceed with the tile. What I am wondering–We currently have white and peach tile with white grout. Do you know if I would be able to remove the grout, paint the tile white, and re-grout a dark grey color? I am unsure if I can grout over the epoxy paint. Hi Steph, I wish I could help you but truthfully I don’t have the answers to your questions. I have never tried to remove grout. I can only imagine it maybe a very difficult task as you don’t want to crack any of your tiles in the process. Also I’m not sure if you can re-grout over epoxy paint,. If you contact Rust-Oleum, I’m sure they will be able to give you an answer on that. Good luck! I painted my bathroom tiles with this product about a year ago and they have slowly turned yellow. Has anyone else had this experience? I may try a second coat and see what happens. Can you tell me where you got your ceiling lighting fixture or what it’s called? Thanks!! Hi Tiffany, the light fixture is from Home Depot. How long did this smell? Our bathroom is tiny and in the interior of the house so no windows. Did it make the whole house smell? Hi Cara, the smell is probably travelling through your house because you have no windows in the bathroom to air it out. I would try opening all the windows in your house to vent the smell out. Good luck! 1. I will have leftover product. Can, or should, I cover with two coats — or is one recommended and sufficient? 2. Will the leftover product keep for a while, or will it harden in the can? Hi David, if you have leftover paint, I would probably do a second coat. The paint cannot be kept once it’s mixed. Hi if you are doing a second coat, how long should you wait? How is the paint holding up? I love the white and just wondered if it is still staying white after a while. Your bathroom looks beautiful! My main concern is safety and exposure to fumes. I have an almost 3 year old and expecting a second. Due to the new arrival, we’re playing musical rooms and switching a lot around. We want to paint over the awful blue 50s tile but I wondered how long the fumes lingered about. The fumes are definitely bad! You need to make sure you open all the windows and vent out the fumes fully. I think we gave it a good 2 days just to be on the safe side. Thank you so much for posting your experience. Looks like this is for sale in the UK (hooray!) Did you need more than one coat? The Tub & Tile refinishing kit looks like people use 3 coats. Just purchased a new home and the tiles in the bathroom and kitchen are horrible. Can this kit or similar work on bathroom floor? 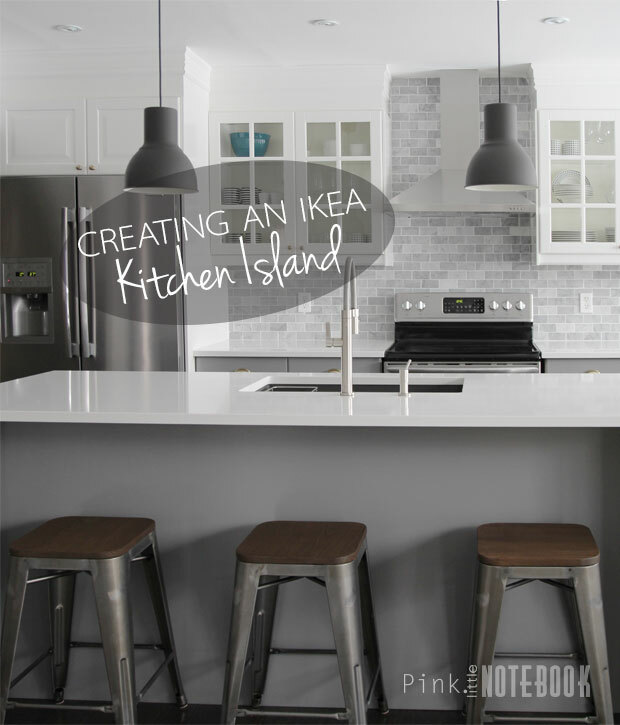 Are you aware of any similar kit that can work on granite countertops in the kitchen? I love your bathroom makeover, it’s gorgeous! I have one question, how did you get those dark gray looking vein like in your floor tiles? I would love to get that exact look. Hi Ivory, the floors in this bathroom were not painted, they were replaced with polished ceramic tile. Ok, I see. I thought you used the paint on both the walls and floor. Anyways, you did an excellently job, your bathroom rocks! How do you paint tiles on the kitchen counter? I didn’t really want this stone. Any other ways? Hello, how long does the paint last with normal use? How hard is the tile to clean afterwards? Thanks. Hopefully it works n marble as well..
Are we supposed to paint over the grout also? now that it has been a couple years I was wondering how well it has stood up through time. We have a bathroom with some very bold pink tile and off white grout. (50s) I planned to do this if it holds up at least a few years before needing to retouch. What are your thought?! Yes I too would love to know how it’s holding up as of now! Me too! How’s it holding up? Hi Kristen, I have since moved from that home so I can’t speak as to its current state. However, I had absolutely no problems with the paint right up until the day I moved from the home (and that’s with daily use of the shower). Epoxy paint is pretty heavy duty stuff. If applied properly it should last quite a long while. However, if your looking for a permanent solution, I always recommend replacing the tile instead. 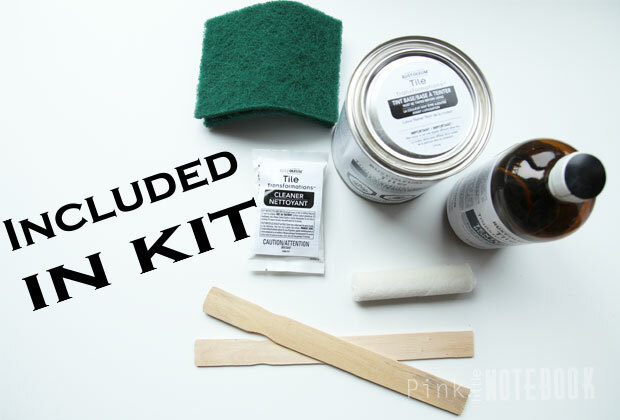 Using epoxy paint is a great alternative if you need a quick, affordable fix. Sabrina, I am very pleased of how you explained everything. It gave me confidence to do it too. I thank you so much for every detail explained. You are awesome!!! Do you have any explanation on how to paint cabinets? I’m also renovating my old bathroom and having lots of fun. Happy New Year and may more fun and well explained project come!! Thanks for sharing! Could you please update us on how well the paint is holding up? My tub is nearly identical to yours and has the 90s pink tile. My husbands swears paint will look awful in a short time. Please prove him wrong so that I don’t have to wait years to update!! Thanks! I did everything exactly how it was instructed … now some areas have started to turn yellow(!) other areas look see-through so you can see the previous patches of gray tile underneath… overall after all the time, effort and expense, I deeply regret painting my tiles. I hope that you are able to find a solution for your bathroom. Question…we had an old shower painted with epoxy paint and it is all peeling off. I’m assuming our painter didnt prep the walls right. Wanting to repaint. Would you think sand all of the old paint off that is remaining and redo with the process you suggest? Any comments from those who have had theirs painted in awhile. This old shower doesnt have much ventilation so is quite humid during and after showers. No fan and a small window. Thanks. I just purchased a home with 5 bathrooms so i’m extremely thankful for finding this article and seeing how good painted tile looks! I’ll definitely be doing this on (2) of my bathrooms! I also LOVE the pain color in the room that this bathroom a joins, Would you happen to have the brand and color for that paint color? I think it’s the it’s a bedroom. Looking at doing this very shortly. Thanks for the guide. Just an FYI, though, that mask you are using while painting is useless. You need to be wearing a NIOSH respirator mask w/ filters specifically for solvents/organic vapours (as in 3M’s model H-6022). Awesome job! I love it. I am a decorator myself and moved into an existing house where the beautiful granite trim doesn’t match the beautiful river rock floor which is all shades of brown, gray and white. ! So, I want to try to paint the brown river rocks white and keep the off white and gray rocks. Anyone have experience painting river rocks? This is on a very large shower floor. Thank you very much in advance. Thanks for being a source of inspiration, I am so thrilled with two updated bathrooms, I have started on a third! I’m so excited to find that this product exists!! We have awful pink tile in our bathroom and I’ve been wanting to get rid of them for years, now I know I can just paint them! you said it has a very strong odor and we only have a small window in our shower, how long did it take for the odor to go away? It was gone by the next day. As long as you have a window to circulate the air, you should be good! I am curious how the paint has held up for the last 4 years. Hopefully, you are still linked to this post and can respond! Hi Christine, Unfortunately, I do not live in that home anymore. However, while I was living in there and using that bathroom daily, I had no issues. It’s epoxy paint so it’s pretty heavy duty stuff if you apply correctly. I used epoxy paint on my garage floors in my current home (although it was a totally different product)and years later it still looks brand new. We’re did you get this paint from? No I did not sand the tile, the kit includes a cleaner that you must use prior to painting. No priming is necessary. This is epoxy paint, very durable stuff! I got my kit from Lowes, however, this particular kit is discontinued in Canada. Hope this helps. I am confused by your post. You show painting a shower with glass doors but post pictures of a tub. I would like to see the before and after of the bathroom you actually painted. The tub bathroom looks like it has added trim around the tub walls. This post is one of many in connection to this bathroom reno. Click the links in the post and it will bring you back to the beginning of this project where I walk through all my other upgrades I did to this space. You can also find the before and after post there as well. This particular post is my tutorial on how I painted my bathroom tile (shower and bathtub tile). As for the tub, the front side of the tile has been painted, hence why I’m showing it. The surrounding tub tile was removed and trim was added to the back wall (which was all documented in another post), Hope this clarifies!.